"Do not act with zeal, do not put forward any arguments to convince these peoples to change their rites, their customs or their usages, except if they are evidently contrary to the religion and morality. What would be more absurd than to bring France, Spain, Italy or any other European country to the Chinese? Do not bring to them our countries, but instead bring to them the Faith, a Faith that does not reject or hurt the rites, nor the usages of any people, provided that these are not distasteful, but that instead keeps and protects them." The Ricci Institute for Chinese-Western Cultural History is a research arm of the Center for the Pacific Rim at the University of San Francisco, a Jesuit institution in the American city that is home to the largest China Town outside of Asia. 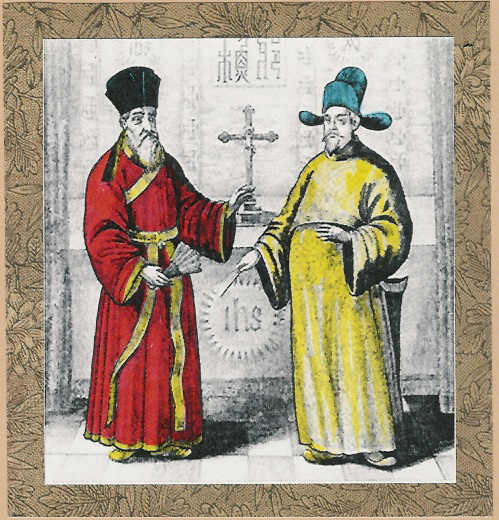 It is named for Matteo Ricci, SJ, one of the first Jesuit missionaries to China. There is also an adoring group of Italians who would like to venerate this Servant of God and they operate a website in Italian, Chinese, and English. In this brief post, I hope to introduce you to Ricci and some of the controversy that swirls around his work. The Jesuits have a long history in China. The most interesting controversy to arise out of their presence there and, more specifically, Padres Matteo Ricci and Michele Ruggieri’s work in China was about “Chinese rites.” The Chinese Rites controversy was a dispute within the Catholic Church from the 1630s to the early 18th century about whether Chinese folk religion rites and offerings to the emperor constituted idolatry. It pitted Dominicans against Jesuits, but ultimately ended in a long-lasting rift between East and West. Padre Ricci is loved and admired still by many Chinese Catholics and also appears in Chinese history textbooks of the post-1949 period for his intellectual and scientific achievements. Padre Ricci wrote critical treatises and translated Western cultural classics, such as the first six volumes of Elements of Euclid and the Handbook of Epictetus. It was, perhaps, his cooperation with Xu Guangqi, a famous intellectual of the late Ming and early Qing Dynasty, on the Euclidean translation and other notable projects that made him an indelible part of Chinese history. Although he was a mathematician, he was not familiar with and could not compute the higher level interpolations developed by Guo Shoujing or even those of earlier Chinese mathematicians. Scientific and mathematical knowledge had devolved during the Ming Dynasty to the point where little was required for the Imperial examinations. Many of the great works were lost or ignored. In this context, the feats of mathematics brought by Ricci, along with the ability to teach coherently, made the mathematics of Euclid seem like a revelation. Xu Guangqi collaborated with Ricci to translate the first six books of Euclid's Elements in 1607. He worked with Ricci on studies of both hydraulics and geography. He was converted not only to Christianity but to western science and continued to work on the mathematics and astronomy after Ricci's death in 1610. The calendar he and Ricci had been working on successfully predicted an eclipse in 1610 after Ricci's death. In 1629, Xu Guangqi had another chance to prove the effectiveness of the new mathematics and calendar system. A competition was held by the court to see which of three schools could most accurately predict the expected eclipse. Both the traditional Chinese school and the Islamic school joined the competition, but it was Xu Guangqi and what was called the New Method School that won. The emperor appointed Xu Guangqi to reform the calendar. He continued to work with a succession of Jesuits sent with additional materials and instruments. He was succeeded by Li Tangjing, who finished the calendar reform. The lives of Xu Guangqi and Ricci were intertwined tightly. Another Jesuit in China at that time, Padre Michele Ruggieri, also collaborated with Ricci. In 1584, Ricci revised a short Catechism, which was the first book printed by foreigners in China. It was originally drafted by Padre Michele Ruggieri, who also assisted Ricci in producing the first European-Chinese dictionary. Scholars believe that between 1583 and 1588 Michele Ruggieri collaborated with Matteo Ricci in creating a Portuguese-Chinese dictionary, for which they developed a consistent system for transcribing Chinese words into the Latin alphabet. While it would be several hundred years before Zhou Youguang introduced Pinyin, this was an early attempt to take the multiple syllables of Mandarin and fit them into a useable system. A Chinese Jesuit Lay Brother Sebastiano Fernandez, who had grown up and been trained in Macau, also assisted in this work. Unfortunately, the manuscript was misplaced in the Jesuit Archives in Rome, and re-discovered only in 1934, by Pasquale d'Elia. This dictionary was finally published in 2001. This dictionary, several important translations, and a catechism behind him, Padre Ricci’s crowning achievement may well have been the great Map of the World, the sixth edition of which, in 1608, was wanted by the emperor. Popularly called "The Impossible Black Tulip," the six panels of Kunyu wanguo quantu, or Map of the Ten Thousand Countries of the World, recently appeared at the Minneapolis Institute of Arts. An astounding piece of cartography, Ricci’s map, labeled in Chinese characters, preceded the journey of Captain Cook and came just over a century after Columbus landed in Hispaniola. Nevertheless, he drew something that we would all recognize today as a rough approximation of the planet’s major inhabited continents. The Kangxi Emperor, at first, admired the Jesuits' respectful and unobtrusive manner; they took the time to learn the Chinese language well and they wore the customary silk robes of China’s elite. Unfortunately, the decree of China’s longest ruling and most enigmatic emperor was not the final word on the matter. A still more forceful condemnation of the Chinese rites occurred on July 11, 1742, with Pope Benedict XIV’s Apostolic Constitution Ex quo singulari. The document reviewed the history of the Chinese Rites Controversy from its beginning in 1645 and quoted in full the various papal statements against the Chinese Rites; reiterated the rejection of Mezzabarba’s “Eight Permissions” as “null, void, invalid, and completely futile and ineffective”; ordered Ex illa die to be observed “exactly, integrally, absolutely, inviolably, and strictly” under pain of automatic excommunication reserved to the pope; expanded the formula of the oath against the Chinese rites; and continued Ex illa die’s prohibition of further discussions of the issue, again under pain of automatic excommunication. With such finality, the question was not re-opened by the Church until 1939, when Pius XII, in his Propaganda Fide, declared the Chinese rites practicable, under certain conditions. We cannot understand the depth of the controversy without some examination of the actual Chinese rites that were, and continue to be, at issue. This will be the topic of a future post. Jihe yuanben, Chinese translation of the first six books of Elements in the edition and comment of C. Clavius, in collaboration with Xu Guangqi, Beijing 1607. Arnold Horrex Rowbotham, Missionary and Mandarin: The Jesuits at the Court of China. (Berkeley: University of California Press, 1942). Pacific Rim Report No. 32, February 2004, The Chinese Rites Controversy: A Long Lasting Controversy in Sino-Western Cultural History by Paul Rule, Ph.D.
 See http://hua.umf.maine.edu/China/astronomy/tianpage/0019bXu_Guangqi_6659w.html. Last update: September 2007 by Marilyn Shea. See http://www.artsmia.org/index.php?section_id=396. Last visited March 21, 2012.